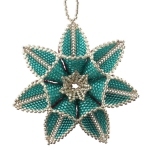 Most people that see this beaded Christmas Star ornament can't believe that it is created from just delica beads and Nymo thread. It is an incredibly sturdy and tactile piece, with a depth of 2.3cm, Although it looks so complicated and intricate, it' actually very simple to bead and create. Being double-sided the ornament looks the same on the back as it does on the front, so you can either use the same colour or mx it up with a contrasting colour so you can change your colour scheme each year! As usual with ThreadABead featured patterns we give full detailed photographic instructions and in this pattern there are 52 detailed steps, making this pattern even suitable for beginners to beading. This ornament bead pattern is made using Japanese Miyuki size 11 Delica. A form of round peyote is used but full detailed instructions are given and no previous knowledge of the stitch is required. Please note the pattern may not work with any other size and type of beads. There are 2-3 delica colours in total and the finished beadwork is approximately 6.5cm x 6.5cm (not including loop), no other items are required – this is purely made out of delica beads. The bead pattern supplied is 18 pages and includes 52 full colour photo instructions.